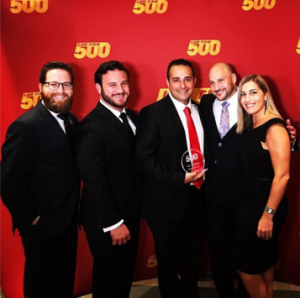 Law Firm 500 is organization that celebrates the fastest growing law firms in the United States. The year 2017 marks the second annual Law Firm 500 Conference and Gala, where Law Firm 500 celebrated the fastest growing law firms in the country. The law firms were evaluated and ranked in order based on gross revenues covering the span of three years. Moreover, the selection committee looked at each candidate’s tax returns from a set year and compared with the returns from three years later. The candidates were evaluated on: finances, the number of offices, the number of employees, and full financial growth, showing the success of their business over time. Law Firm 500 acknowledges that to achieve these impressive numbers, a firm must be innovative in their business and marketing models, incorporating technological advances and strategic vision. The attorneys and firms on this list, which can be viewed here, have shown unwavering commitment and tenacity in the legal profession. The 2017 Law Firm 500 Awards was presented at the Second Annual Conference Awards & Gala from October 19, 2017 – October 21, 2017 at the Waldorf Astoria in Boca Raton, Florida, featuring Keynote Speaker Daymond John. Meltzer & Bell is proud to receive such an amazing honor and will continue to strive for growth and advancement in the services that we provide and in contributing to effectiveness in the legal community.